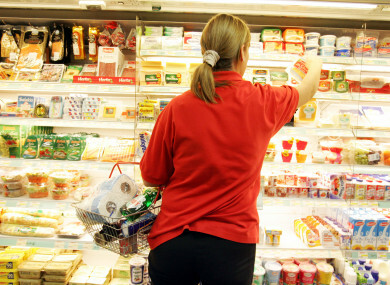 IRISH PEOPLE SPENT an extra €90 million on their Christmas grocery shopping last year, a new report has found. Over the Christmas period, the average household spent a record €1,532 on groceries – an increase of €38 compared to last year, according to figures released by research body Kantar. The figures compiled by the firm relate to spending in the 12 weeks ending 31 December 2017. Among the retailers, Dunnes Stores remained the top Irish supermarket with the grocer capturing market share of 23.0% – up 0.3% from last year. Tesco finished up on 22.8% while SuperValu finished just behind on 22.4%. Lidl and Aldi received 10.4% and 10.3% of the market share respectively. Kantar director David Berry said that the increase in the spending was driven by staple items, with fruit, vegetables, meat and poultry posting a combined sales increase of €28 million. The trend towards online shopping shows no signs of slowing down with online grocers experiencing impressive sales growth of 24%. Email “Irish people spent a record amount of money on their Christmas grocery shop last year”. Feedback on “Irish people spent a record amount of money on their Christmas grocery shop last year”.